Written by David A. Stewart. Deaf Sport describes the full ramifications of athletics for Deaf people, from the meaning of individual participation to the cultural bonding resulting from their organization. Deaf Sport profiles noted deaf sports figures and the differences particular to Deaf sports, such as the use of sign language for score keeping, officiating, and other communication. 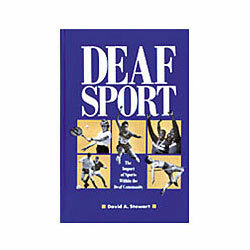 This important book analyzes the governing and business aspects of Deaf sport, both local deaf groups and the American Athletic Association of the Deaf and the World Games for the Deaf. It shows the positive psychological and educational impact of Deaf sport, and how it serves to socialize further the geographically dispersed members of the Deaf community.